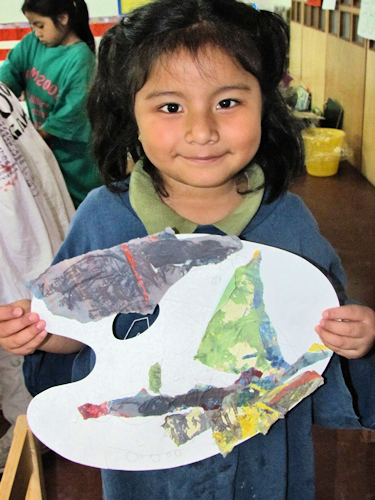 Kids Share in Guatemala & Vermont – Page 2 – Awakening the artist and author inside every child. We had been collecting medium-sized plastic yogurt containers, and today we brought them all in. Out came the painted tissue paper and the glue, and the children covered the outsides of the containers with the colorful paper. Jeanne peeled off the tops and bottoms off of avocado pits, and the children pushed two toothpicks into each pit and balanced them on top of the beautifully decorated containers. The children will be able to watch as the pits sprout into little avocado trees! The weather in Vermont must be rather crummy, as we attempted to Skype Phoebe’s Vermont classroom with the PanaKids in the morning but kept getting cut off. Additionally, we attempted a Skype get together with the Boys and Girls Club in the afternoon, but that didn’t work either. Finally we connected with a friend of Jeanne’s in Vermont named Nancy, who had been out in her garden in the rain when she heard her computer ringing. The children wanted to know about what she was growing in her garden, and what animals she had. Finally, we all sang the Kids Share Song and then moved on to our next project. Please join us again next week as we wrap up our Workshop at PanaKids School! 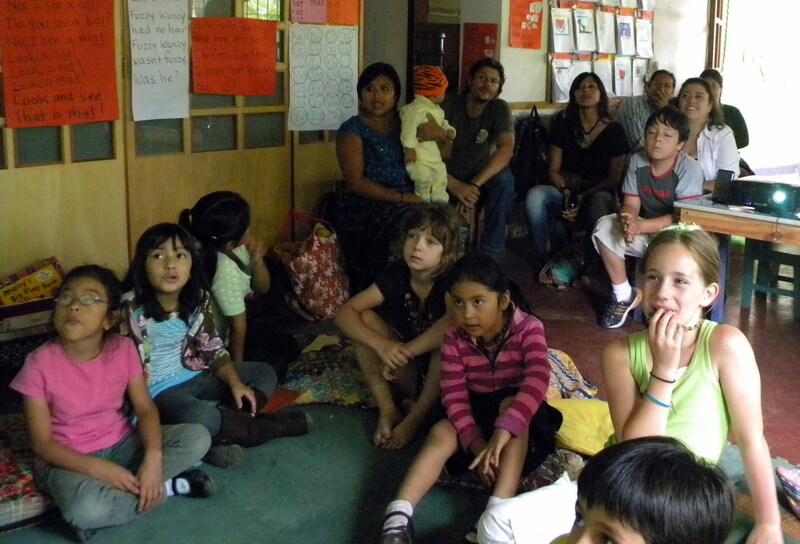 Phoebe began today’s workshop with the Kids Share Song, and the children are really getting into echoing it with her! Then we got out the paper artist pallets that the kids sketched on yesterday, as well as the tissue paper they had painted earlier in the workshop. With tubs of watered down glue and paint brushes, Kristina demonstrated how she wanted them to fill their sketches in with the tissue paper. Then she and Dina interviewed individual children on video and asked them the questions that the Boys and Girls Club kids in Vermont had for them. Some of the younger children were so shy! It seemed to some that it might be more fun to watch the interviews being made than to be in them! Meanwhile, Jeanne worked with the group gluing the painted tissue paper onto the paper pallets. Each child took their work very seriously, carefully choosing the colors they wanted, and tearing or cutting out the shapes they wanted. As the pictures filled in they seemed to come alive! Please click here to read about Day 9 of our Workshop. When the children got to PanaKids today, Phoebe led the group through a practice of the Kids Share Song, which we often hear them humming while they’re working! We wanted to share the photos we had taken last week with the children, so Jeanne set up the computer and the projector and sat them down in front of the whiteboard. They giggled at the pictures of themselves and the fun they had; it was a great reminder to them of what we had all accomplished! The weather today was so perfect for a walk by the lake that we didn’t waste any time getting the kids ready to leave. With Dina’s help, we walked through Panajachel two-by-two until we reached the lake. Then we followed a cobblestone path east to a place that had been set up for football games (soccer) with concrete bleachers. We handed out paper artist pallets that had been donated by the Vermont Arts Council, and asked the children to sketch what they saw. Panajachel is a small town of about 11,000 residents and many tourists. We’re up at around 2,500 feet and are surrounded by the prettiest, steepest green mountains that ebb and flow as they fade off into the distance. This precious land cannot be left completely wild; instead, that which is owned by locals is terraced for growing all sorts of fruits and vegetables on the hillsides. On the north side of Lake Atitlan, Panajachel serves as one of the populated and tourist areas where the indigenous Mayans from the dozen or so villages surrounding the lake can come to sell their amazing weaving and embroidery. Wooden mask carving, marble carving, jewelry (woven and beaded), artistic clay work and textiles round out the offerings of the street vendors. In another week or so we’ll be heading up into the mountains to Finca Dos Marias (Farm of the Two Marias), and one of the projects we’ll be doing with the children on that farm will be to ask them to think about what they feel represents their lives in the cloud forest of Guatemala. 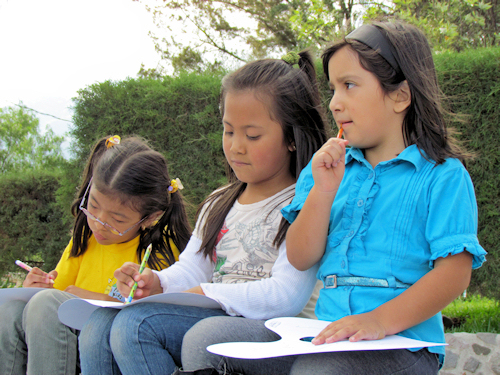 So in preparation for that, we asked our PanaKids to sketch the lake and volcanoes that are such an integral part of their lives on Lake Atitlan. What they drew was amazing! Along with volcanoes, we found in their sketches the sun, boats, fish and birds flying through the clouds. As we were finishing up, a fisherman came in with his nets, and he had caught a bucketful of small fish that the kids enjoyed peering at. On our way home we sang our Kids Share Song, and the children had big smiles on their faces when they were met by their parents! Please click here to read about Day 8 of our Workshop. 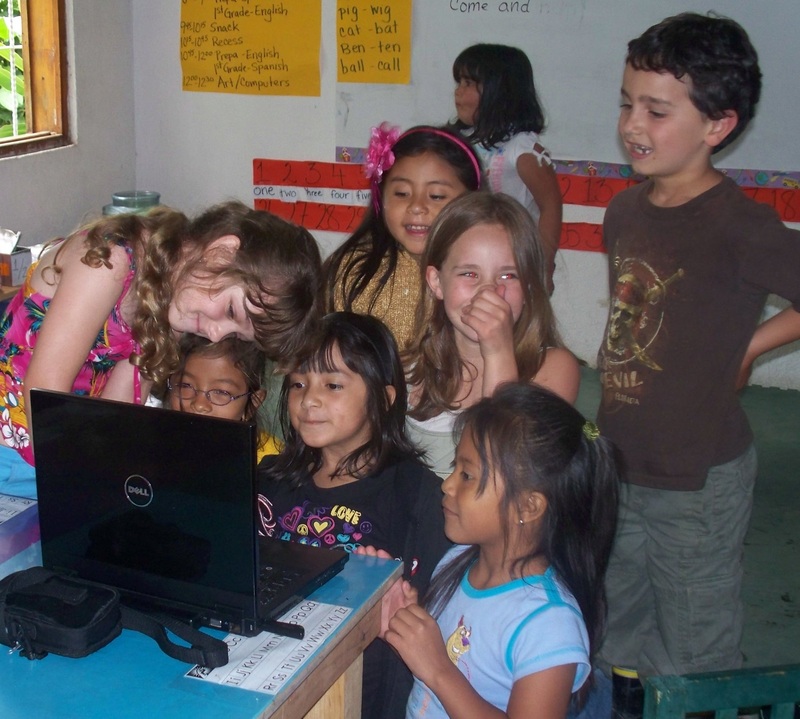 We set up the computer for a Skype visit with Kristina’s mom, in the United States. The children all introduced themselves to her and she asked them questions like, “Are you enjoying the Workshops?” (“YES!”) and, “What is the weather like down there because it is hot here today?” (“Nice!”). We’ve been encouraging the children to put any organic food into a covered bin that we bought for them, and today we all worked together to dig a trench by the side of the school to bury it, so that it will turn into rich, dark soil for their garden. Hony, Cesar and Juan Antonio, of K’aslem Mandala Program of permaculture gardening techniques, come into PanaKids on Thursday mornings to work with the children about how to care for our precious environment, teaching school children and village youth how to protect the trees, the water and people, learning to become tomorrow’s village leaders! They are planning gardens at PanaKids, and the compost that we’re making will help to feed those gardens. Once the trench was dug, Kristina poured the vegetable scraps that we’ve been accumulating into the trench (to the “euw’s” and “p.u.’s” of the girls) and then covered them with cardboard and some dirt. Hony assures us that he will show the children how the worms and bugs will turn the food scraps into the rich dirt, which will then grow big, healthy vegetables! We then went inside to work with the tissue paper we had painted on Tuesday. The children couldn’t imagine what we were doing when we tore the paper into small pieces, and then “painted” the backsides of the torn pieces with watery glue. Kristina showed them how she could glue the pieces onto the front of her cardboard journal and create a beautiful collage. 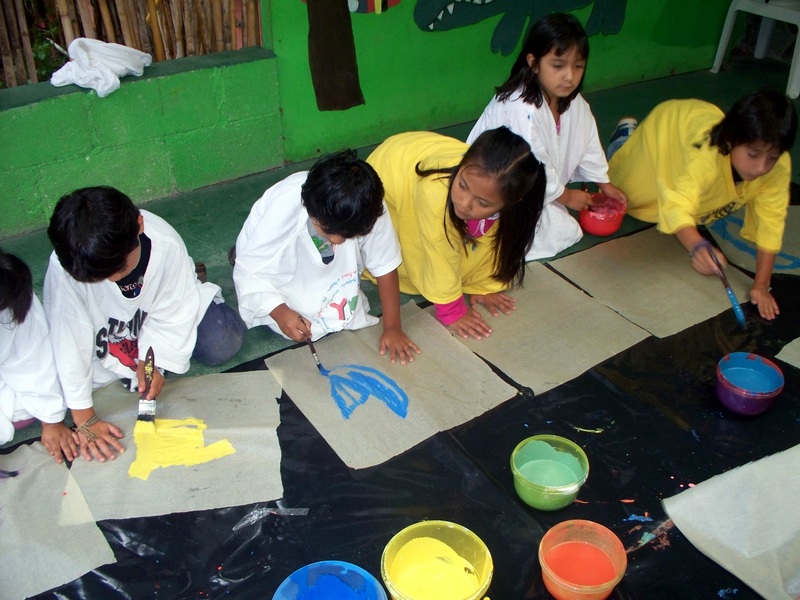 The next thing we knew, the children were fully engaged in choosing their own colors, tearing up the painted tissue paper and intricately gluing the pieces to the covers of their own journals. They were so incredibly proud of how they each turned out, even though it will take a good night of drying before they can be drawn in again. That’s okay. We’ll be back again next Tuesday for more Kids Share Workshops! This morning we woke to a bright, sunny day and were excited to be going on our afternoon field trip to the Atitlan Nature Reserve. It is a 400 acre protected area that contains interesting plants and animals, including monkeys, the raccoon-like coatis and exotic birds, such as Guatemala’s national bird, the quetzal. Julio (of Posada de los Volcanes Inn and Tour Company), his wife and her brother offered to accompany and drive us all to the Reserve in a large excursion van. We sang songs all the way to the Reserve, including the Kids Share Song. When we got there it was beginning to cloud over. We’re here in Guatemala during the rainy season, and have been so incredibly fortunate to have had more nice days than rainy ones. But nearly every afternoon, sometime between 2 and 6 PM, it begins to rain. Wouldn’t you know it, today it decided to start raining right after we had all taken a couple of turns on the children’s zip line. Everyone LOVED the zip line; the adults pulled the bars to the beginning platform and the kids pushed off and flew down to the bottom, laughing all the way! We ran over to the pavilion, where we took out our journals and drew some of the things we could see from there. Flowers, huge multi-colored leaves, and even the “Extreme Zip Line”, where a group of college kids were zipping over the rain forest through the downpour! Our plan had been to hike some of the nature trails and see the butterfly preserve, which has more than 2,000 plants and approximately 300 live specimens of nearly 10 species of native Guatemalan butterflies. We were going to stop and sketch in our journals along the way. The hike also would have taken us to a 23 meters (75 ft) high waterfall and three suspension bridges at the end of trails that go past an ancient coffee grove and a beautiful ravine. The native trees and the flowering and seed plants of the Reserve are an island of vegetation that attracts great numbers of native and migrating birds. 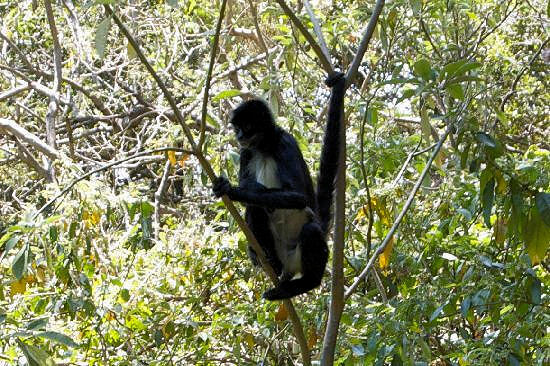 What we were truly looking forward to was seeing the spider monkeys, so when the rain let up a little we wandered off into the forest a bit and, lucky for us, we DID see some of these beautiful and graceful creatures!! One very large black spider monkey came down and sat in front of the kids, putting on a real show! Two other brown spider monkeys gracefully glided above our heads. It was so exciting for all of us! We sang songs again all the way back to PanaKids School, where parents arrived to pick up their precious children who, no doubt, told them all about their adventures in the rain! Please click here to read about our Thursday Workshop! We had so much fun today! Kristina got out the paint that we began working with last week, and she showed the kids how to mix some more colors. 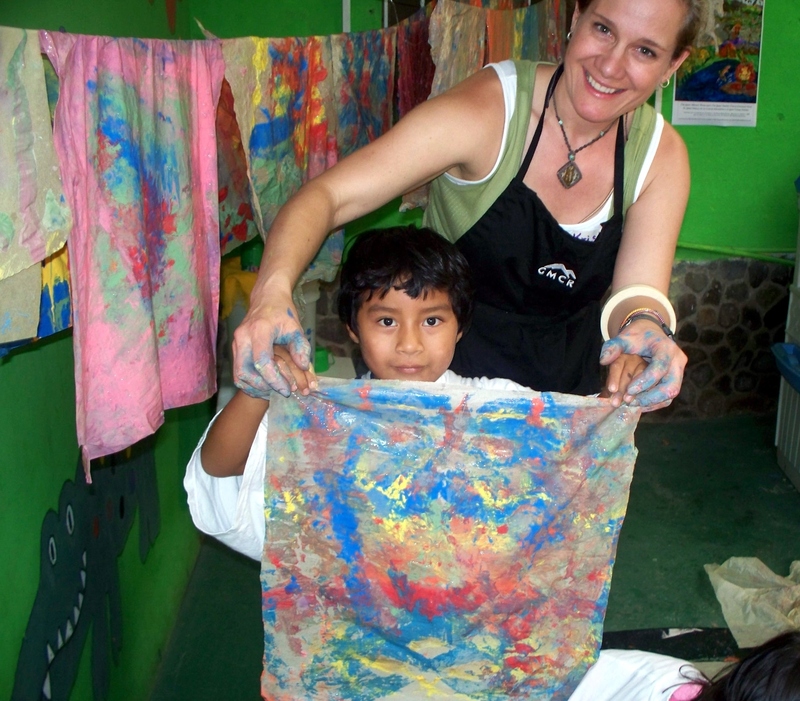 After donning the tee-shirts that we brought for smocks, the children dipped their big paint brushes into the bowls of mixed paint and drew designs on the tissue paper that was donated by The Drawing Board in Montpelier, Vermont. 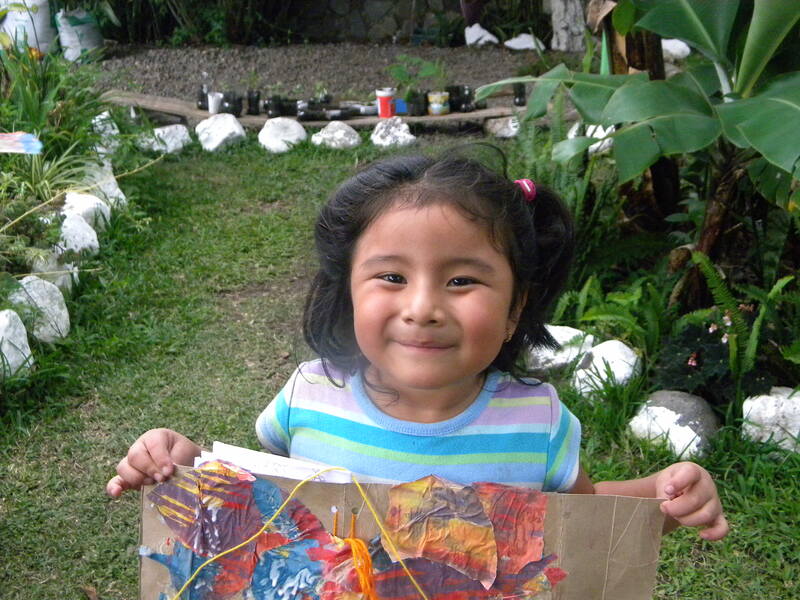 As each painting was finished and hung up to dry, we passed out even more tissue paper for them to paint. Kristina showed them that crumpling the painted paper changes it’s nature, and spattering paint on top of their pictures enhances how interesting they can be. We experimented with hand prints and different brush sizes and strokes and colors on top of colors. The kids loved to see their designs morph into beautiful pieces of art! We were all having so much fun that it’s all we worked on today. See what the kids did with these beautiful tissue designs on Day 6 of our Workshop! Please click here to read about what we did during Wednesday’s Kids Share Workshop.